Located just off of Highway 30A on U.S Highway 98, Santa Rosa Beach offers its residents and visitors an array of vacation amenities, such as upscale shopping, dining, and entertainment options, all surrounded by some of the most upscale and state-of-the-art living accommodations, both rental and residential. 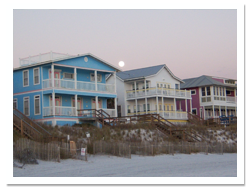 Santa Rosa is located on the far western end of 30A, with only Dune Allen Beach located to its west. Like many of its equally picturesque neighbors, Santa Rosa Beach Is consistently ranked among the best beach destinations in the country and one of Florida’s best-kept secrets. Located in the Santa Rosa area is Topsail Hill State Preserve, a woodland area much like Grayton Beach State Park, with a number of scenic dunes and coastal dune lakes and waterways that have remained largely unspoiled despite the increasing development of the area. Santa Rosa Beach also has access to Point Washington State Park, a 15,000-acre nature preserve which includes more than 10 miles of hiking and biking trails for residents and visitors. Golf enthusiasts can also take in 18 challenging holes at The Santa Rosa Golf and Beach Club, with two holes that back up to the scenic Gulf of Mexico and the remainder of the course winding through the scenic nature areas of Santa Rosa. Considering its close proximity to several larger cities such as Fort Walton Beach and Sandestin that have started to grow outward, Santa Rosa boasts a greater number of dining options than some of its smaller beachside neighbors, including several pizzerias, seafood restaurants, bakeries and delis, and even a traditional Greek café. Whatever your taste, there’s a fare for everyone in Santa Rosa. For those seeking a getaway, either a short-term vacation or more permanent relocation, where the features and amenities are almost endless and constantly growing, Santa Rosa Beach is the perfect spot for you.